Traditional publishers spend millions on market research to see what does and doesn't work, and tailor their publications accordingly. Indie authors don't have access to that, but by interviewing each other, and using information from epublishers like Smashwords, we can learn as well. I find this info both enlightening and useful in terms of how to best position ourselves as authors. Now just a caveat: no one should publish based on statistics. The very reason indie publishing exists is because trad publishers are more interested in following trends than publishing great work. We don't want to give that up. The only real way to be successful is to write what you love. If what you're writing doesn't make you happy, no one else will enjoy it either. However, there are things we as indie authors are doing that shoot ourselves in the foot, and we can position ourselves to be successful without compromising our artistic goals. 1. 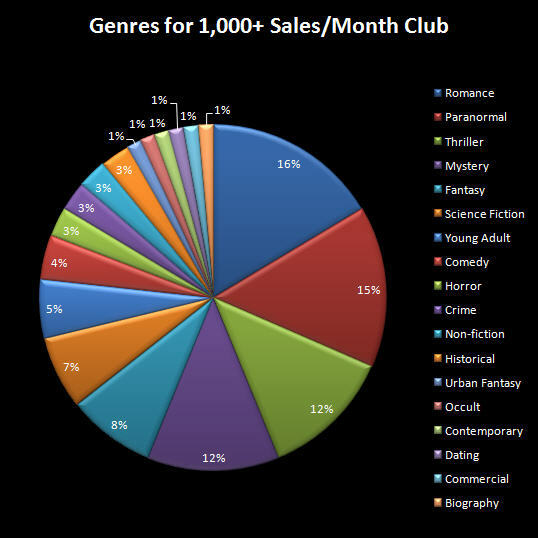 Write Genre Books - It's a known fact that genre fiction is driving sales on ebooks. The four most popular genres are romance, paranormal, thriller, and mystery. So what are we supposed to do with this information? Well, it means that if you write science fiction romances, you're in a good position to be successful. But if your chosen genre is contemporary memoir, should you throw in the towel? No, it just means you've got an uphill climb. 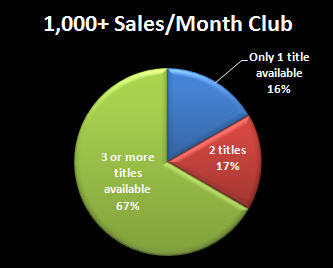 You may not achieve monster bestseller status, but you can still sell the books you love to write. Now if you're writing literary fiction, and you have a romance novel you've been thinking about, go ahead and write the romance. 2. Write Longer Books - Right now, one of the biggest trends in indie publishing is short stories and novellas. I admit, I'm doing that myself with TOONS and Flying Saucers. There's a lot of reasons why, but what's enlightening is to see how sales don't really support the practice. Are short stories and novellas really what the readers want? Apparently not. 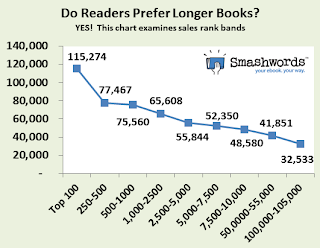 The top 100 bestselling Smashwords books averaged 115,000 words. The next most popular tier is 77,000 words. It makes sense. Would you rather get 10,000 words for $2.99 or 80,000 words for $2.99? Longer books at lower prices are a better value. We can use this as authors by publishing longer books. Focus on writing full-length novels and supplement those with short stories. Or bundle together shorter stories into 70,000 word books. 3. Price Your Book at $2.99 - One of the biggest questions out there for indie authors is what to price your books. Do you go for 99-cents and make your profit in volume? Or do you go for $7.99 and make your profit in high margins? Well, Smashwords has an answer. 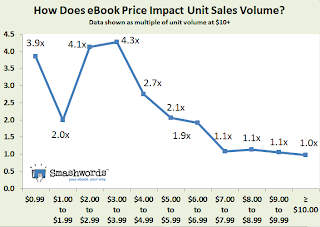 By analyzing the data, we can see that the price that sells the most and is the most profitable for the author is $2.99. That's an amount that readers seem comfortable with paying, and can make you a lot in terms of profits. 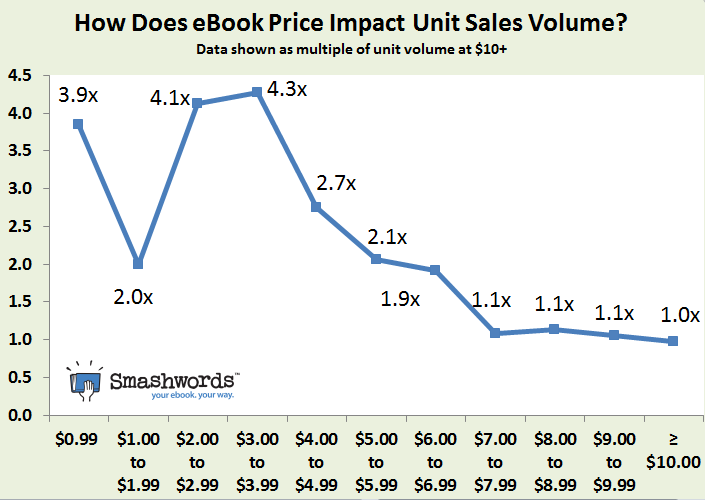 On the opposite end, according to this chart, avoid the $1 to $2 price point like the plague. You'll actually make fewer sales than pricing it at $.99. 4. Publish At Least Three Books - According to numerous sources, most bestselling authors have more than one book on the virtual shelves. 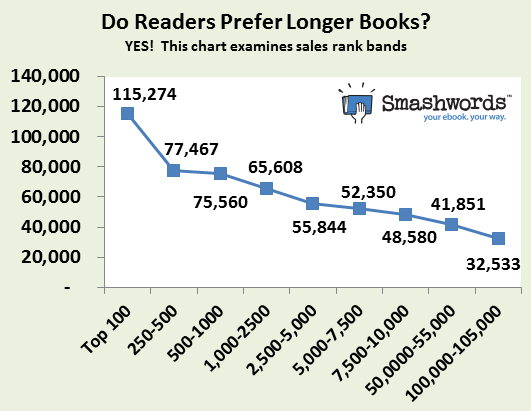 The stories of authors who become bestsellers on their first book are few and far between, but authors who found success with several books are more common. Imagine you've written one phenomenal book. Your reader buys it and loves it. Now what? They go on to read someone else. Maybe they check back to see when you publish another, maybe they don't. But what if you have two books? Or three? Your reader who just liked your one book will go back and buy another, and another. Now your one book sale has turned into three book sales. That means one key to success is a good back-list. Write more books. Of course, none of this is magic. Just because you have three 110,000 word paranormal mysteries at $2.99, doesn't mean you'll instantly be a successful author. Likewise, just because you have a 3,000 word memoir at $9.99, doesn't mean you won't be a literary superstar. Ultimately, your success will be based on how good a writer you are. Statistics aren't rules, and rules are made to be broken. But I think it helps in the equation, and I plan to try some of these. Will you follow any of these rules? Which rules have you broken? Let me know in the comments.